The 50-year civil war is over in Colombia, setting the stage for a more prosperous era in the country. President Juan Manuel Santos signed an agreement Wednesday night with leaders of the FARC rebel group, concluding four years of intense negotiations held in Havana, Cuba. The agreement ends a conflict that killed an estimated 220,000 people and displaced millions. "We reached a final and definitive agreements to put an end to conflict with FARC," Santos tweeted Wednesday night. "Together we open a new period in our history." Beyond the major humanitarian and social benefits, one of Santos' key arguments for peace was economic benefits for Colombia. Although Colombia has been one of the faster-growing economies in Latin America in recent years, the FARC controlled a wide swath of undeveloped land. Plus thousands of people under its control were essentially unemployed. And the war made some areas impossible to travel through. Developing the country's rich farmland, improved transportation and shifting spending from military to job programs are three key ways by which Colombia stands to benefit from peace, says Alberto Ramos, head of Latin America research at Goldman Sachs. But peace isn't cheap. 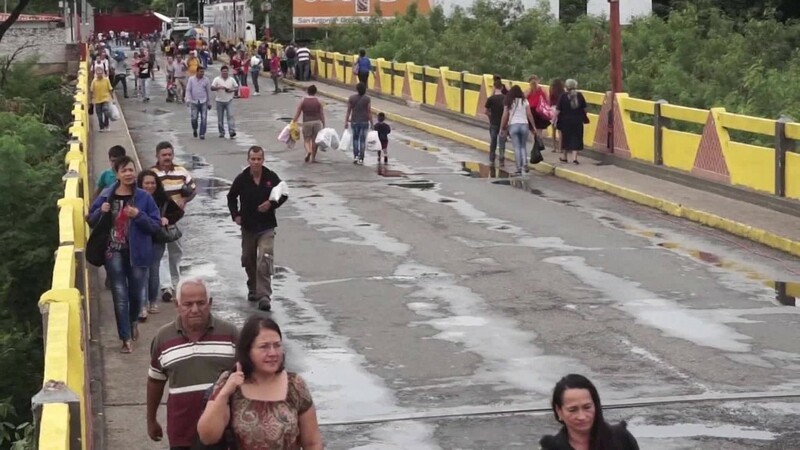 The government now must reintegrate all the civilians living in FARC territory with the rest of society. There are also costs of land reform agreements in the deal, and reparations to be paid to families of victims. "The implementation will be costly," says Ramos. But he emphasizes: "There is a benefit that is unquantifiable, which is the benefit of a peaceful country. Then there is the economic [benefit], which will accrue over time." While Colombia's neighbor, Venezuela, has spiraled into chaos, Colombia has made strides to shed its image as a cocaine capital. Drug violence has declined significantly from the days of warlord Pablo Escobar, and it's now one of Latin America's best economies. 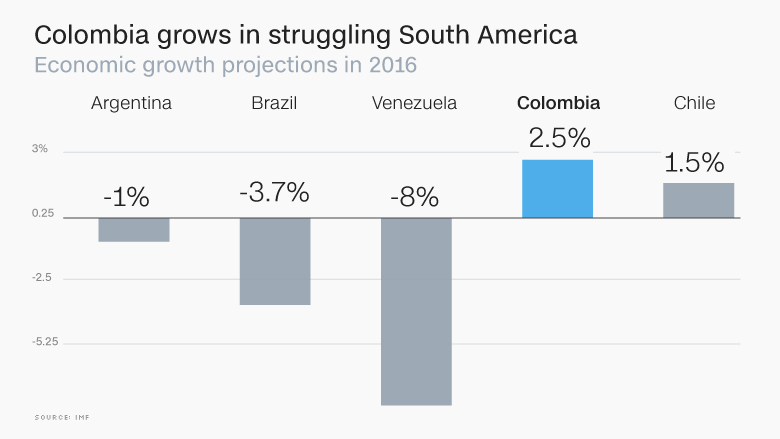 Despite some headwinds, such as low oil prices and a weak currency, Colombia's economy is projected to grow 2.5% this year. That's not as much as in previous years, but it's better than the forecasts for other countries in the region like Chile, Brazil and Argentina. Estimating exactly how much Colombia stands to gain is a challenge. Santos said last year that peace could add an extra 1.5% to economic growth. Economists forecasts vary but all agree: this is a major victory. "This has been a tragedy for 50 years," says Ramos. Now "you're investing in a more peaceful and stable country."